Welcome, Pinterest people! 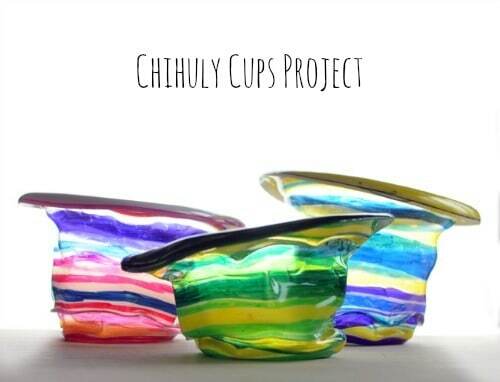 I’ve had so many questions regarding my Chihuly cup project. I made these with cups I bought at our local grocery store, and since then have had trouble finding. Boo. I used the cups with the little #6 on the bottom inside the recycle symbol. I can’t seem to find them at grocery stores or Target, but have found some at dollar stores. When I was studying ceramics in college, I would sometimes wander upstairs a level and visit the glass department. I had a couple of friends who majored in glass and I would watch, fascinated, while they pulled globs of hot glass, on long pipes, out of the furnace (the glory hole) and turned them around while blowing through the pipes, to let gravity and breath help form their vessels. I didn’t realize until years later that Dale Chihuly had set up the glass program at RISD and taught there for over a decade. 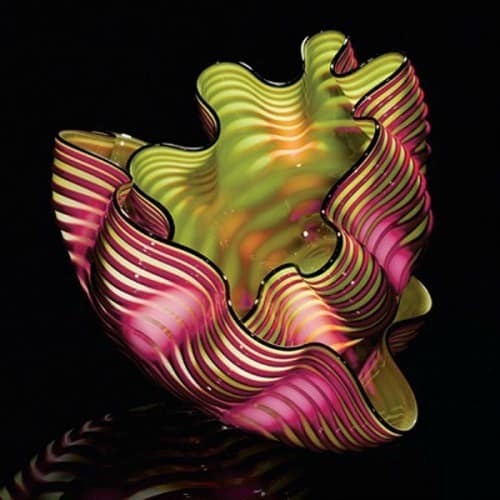 Even if you can’t place his name, I’m sure you’ve seen photos of some of his most famous pieces- colorful, undulating vessels that look like beautiful sea creatures. 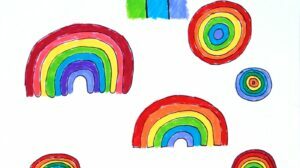 Most projects based on famous artists are great in that they give kids a little insight into an artist’s style. 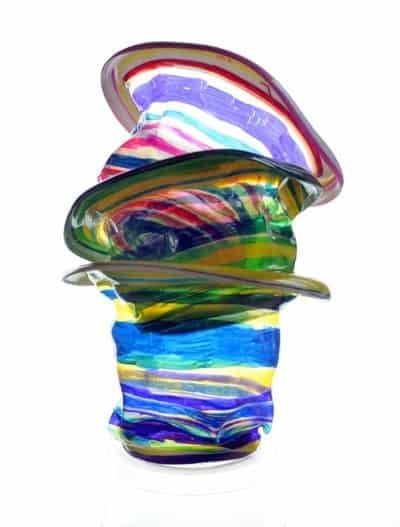 This project is not only fun to make, the results are uncanny in their ability to emulate blown glass vessels. Heat and gravity work on plastic cups much like they are used in glasswork. Clear plastic Solo cups, tall and/or short – I used cups with the recycle number 6 on the bottom. I haven’t tested other cups! Color stripes of varying thicknesses around the outsides of the cups. We had fun picking out our color combinations. For a couple of the tall cups, we ended up coloring the inside bottoms of the cups, because they are so visible after melting. Preheat oven to 350 degrees. Place cups, right side up, on foil-lined baking pan in the oven and watch them. They will slump in about 1-2 minutes and then they just stop on their own. Remove them from the oven and let them cool completely. We tried out the shorter cups as well, and they ended up melting down nearly-but-not-quite flat. Still really cool, but you can’t use them as mini bowls like you can the larger cups. It’s uncanny how much these things look like glass, and it’s really hard to stop making them- there’s something about the unpredictability of how they slump and the instant gratification when you watch them transform. We’ll definitely be making these again. Thank you for your interest in SOLO Cup Company products. Our clear plastic cups are not designed and intended for use at a 350 degree temperature. Therefore, we have not tested the product at that temperature and would not have data available. So… not much info. here, but as with any project, use your best judgment and skip it if you are worried about its safety! Like this project? 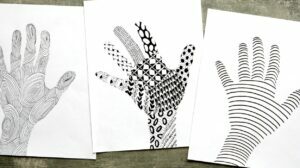 Check out my Easy Zentangle drawing project, Crayon Transfer Technique, and bubble printing geometry project. These are the Sharpies we buy. Look at all those colors, drool. Wow. Those look really neat. Hi Dyan- they’re just the best project. Each one is different and they come out so cool looking! These are AMAZING, Jeanette!!!! Pinning! Thanks for the pinning love! These are SO neat! Love how they catch the light! Yes- my darling husband took the photos after I failed miserably in getting the light to shine through and show off how cool they look. This may be the coolest thing I’ve ever seen! My girls loe Chihuly and we saw the exhibit three times when it was in Boston. Your project looks great! I love that you saw the exhibit 3 times- that’s Chihuly love. I just love this idea! There’s a beautiful permanent installation of his in a nearby town. I’d love to take the kids there and then do this project. Thanks! It’s kind of magical to see his work in real life. There’s nothing better than showing kids big, cool sculptures and witnessing their reactions! Hi JeanetteLOVE these! 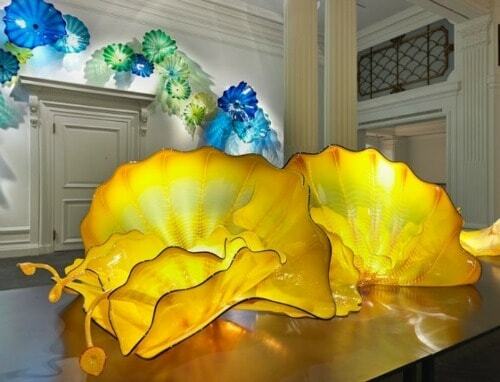 I agree – I have seen (and taught) and bunch of Chihuly projects that didn’t related to his process. Definitely want to try. Thanks for posting! I did this once. I was trying to come up with interesting tree ornament ideas and if you let me go a bit too long they get really flat. What do you do with them? You could drill small holes in them and attach clear fishing line and make sun catcher mobile to hang from a window or deck. I love this idea- I think they’d look beautiful hanging in a window! We used to do this a lot while camping. We would put Solo cups on long sticks and hold them over the fire til they melted to unique shapes, then press the shapes together while they were still hot and soft to make big sculptures of all different colors. That sounds TOTALLY fun! I didn’t even think about sticking them together. 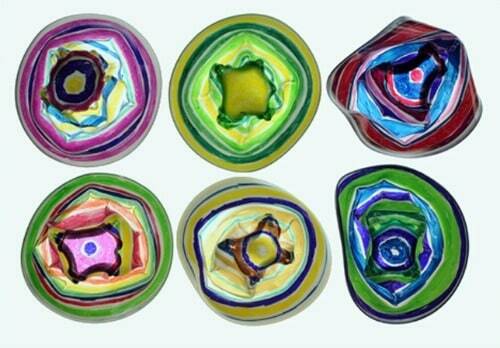 just wondered if you cut the cups and slid them together, would they adhere as they melted and create shapes? I don’t know, but I love that idea! I’m going to guess they wouldn’t become hot enough for the plastic to fuse together, but that’s really a wild guess. Now I must try this as well! These are absolutely amazing Jeanette. The kids would love to do this. Yay! Make some! Show me! I can’t wait to try this this summer. I have budding artist and they love glass. Great to hear! It would be fun to do a real glass project with kids somehow- I wonder if there is a modified sort of glassblowing project kids could do. Hmmmmm…. Not sure about a glassblowing project. My 11 year old has done 2 glassblowing workshops. He had so much fun. Check to see if there are any workshops around you that will work with kids. I am sure you already have. These are so pretty! I’ll be featuring them on The Crafty Crow! Oh, thanks Cassi! So excited! Surprisingly stunning! Love the result, and it looks super simple. Thanks for the great idea! Hi Michelle- Thanks for stopping by! 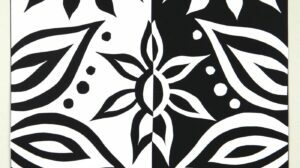 They are simple, which makes the project that much more fun when you get cool results. I’d love to see your cups if you make some. These are great! I would like to try them with my students but so far my practice attempts have not turned out. One kind of plastic cup barely melted at all and the other one melted into a completely flat disc. I can’t find clear Solo cups where I live – only colored ones. Could you tell me what kind of plastic (the # that is on the recycling sign on the bottom) and what size of cup you used? Thanks! Hi Teagan- We used the 16 oz plastic #6 cups. The smaller cups were 9 oz (no. 1 plastic) and got fairly flat. Awesome! Thanks so much for your help. Can’t wait to try again! Sure thing- I’d love to see your results when you do this again! These are absolutely stunning!!!! I love this project! Thanks for sharing at For the Kids Fridays! I am featuring this project at this week’s link party over at SunScholars! Aw, thanks Rachel! I’m so glad I found your link party- I’ll be hanging out with you more often! I’m worried about the toxicity of melting plastic. Any thoughts? You know, Pat, that’s an excellent question, and one I don’t have an answer to. I tried a few Google searches, but only came up with lots of those sites where people give their opinions- no facts. I have an email into the Solo company, but not sure if I’ll hear back or not. If I do, I’ll be sure to reply to you again and update my post. My personal opinion is that they are in the oven for such a short amount of time that I am not too worried about any ill effects of plastic fumes. I would imagine that if you did this on a consistent basis, you may have problems. I’m really not sure though, so I hope Solo gets back to me. Thanks for bringing this up! This is such a fun idea! Love it! I love this! As a designer I love setting unusual and dramatic tables for parties and dinners. I’m going to have my grandsons make several of these and put battery operated tea lights inside. Then use them as the centerpiece for our next family get-together. They will be so proud! AWESOME idea. Oh my- this will look so good. If you feel like sending me photos or posting them on my Facebook page, I’d love to see them! Christmas decorations and tags! That is brilliant. I think we will be making more of these at Christmastime. This looks like a lot of fun. Can’t wait to try it out with my girls. Thanks for sharing! Oh, I’m so glad! Feel free to share their finished pieces on my Facebook page; I’d LOVE to see! these are really cool. I’m thinking I might string them and hand them outside. or may be string lights through them. May be even a wind chime. Dear Jeanette, wonderful craft !! Woah! Your glass pieces are completely gorgeous- I’m amazed. I hope your kids will enjoy this project- but maybe they’ve already been able to play with blowing glass? Thanks Jeanette for the compliment. I know they’ll adore this project, they are still quite young so no hot glass blowing yet! Just happened to come across this when looking to make a chihuli inspired baby mobile. after you bake it, does the plastic get harder than it was in its original form? or is it still flexible plastic? really hoping that it hardens up. i have thought about using shrinky dink paper and pulling it out when it curls, because that becomes hard as rock plastic, but i like the more 3D look of these more. They do become rigid! The plastic shrinks in, so it becomes thicker and hard. You’re in luck… I’d love to see your finished mobile if you feel like posting it on my Facebook page- good luck! Has anyone tried drilling holes in the bottom and slipping them over the small bulbs of a strand of Christmas lights? I think I will try this for our outdoor lighting (instead of Chinese lanterns)! I completely, absolutely love this idea! Let me know if you try it. bet it would be really cute. Oh, cool! Thanks so much for sharing this. Do you happen to know what # plastic the solo cups are? I have just been trying to melt my cups flat so the ones you used sound perfect! Thanks! Georgina- they were #6, which I am finding increasingly hard to find these-a-days. Thanks – I will start my hunt for them! I am working with my daughter on a project for shool and we need them to melt totally flat and are really having a tough time. All that we have used are #6, but only some melt totally flat. The rest are curling up a LOT. We have had luck with the 2oz Brite Concepts ones, but no luck with the more expensive ones from Party City. The large red ones from Costco work well pretty much every time. So far only red ones are working. I am going to hit the dollar store today to see what I can find. I realize this is three years after you posted, but hope your project worked out! I don’t think it would get hot enough, but that would certainly be cool if it did! Give it a try; it’s such a satisfying project. 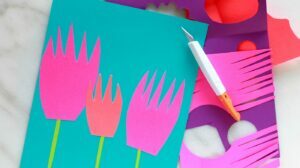 I too found this project on pintrest, looked super fun but gave no details, so I found you, thank you, I’m going to give this a try, just so you know I found this other site that gives a little different way as well,http://crafts.squidoo.com/shrinky-craft-made-with-plastic-cups, have fun! Thanks Susan! That’s interesting- that project uses the white plastic cups. I hope you love this project as much as we did! Can you use a gas stove as well? Or does it only need to be electric? We tried it in a toaster oven outside and there was a bit of a smell but it wasn’t too bad. Hi Winnie- I used a gas oven. I had heard you can only do it in electric, but it worked beautifully in our gas oven. Toaster oven is such a good idea if you want to get outside to be extra safe! How did the cups turn out? I have been wanting to try this in my son’s class. 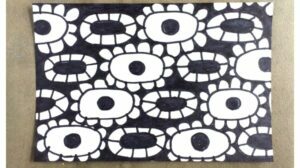 Yes, at our low budget public schools parent volunteers teach art… Anyway i am trying to find a safe way but I might just have to bring the cups home for melting. I was going to try a heat gun. Y question is did these smell when melting? I saw a pin on using overhead projector film and oh my those are toxic to melt. Don’t try it! lol. Wow- I haven’t heard of using overhead projector film for this! It had a slight smell, but not terrible. My biggest concern would be finding the cups- I’ve tried to find them recently and couldn’t find them anywhere!! You are awesome for going in and volunteering for art. I feel like a lot of parents wouldn’t do that. Please let me know if you find the cups and experiment with a heat gun- now I’m really curious about that. Thanks Jeanette. I tried with the the embossing heat gun and it worked! Yay. Didn’t notice a smell that would make this too noxious to just do in the class. I didn’t anticipate finding the cups to be a problem though. I had a stack left over from a party. They have a 1 not a 6. I usually grab these at the dollar store before big parties (with kids) so I don’t have a bunch of glasses to wash.. Now I hope they still have them. I’ve been trying for months to figure out a Chihuly lesson in the classroom. Appreciate your wonderful explanation. How cool that the heat gun worked! I’m glad, because half the fun is watching the cups change. And now I’ll have to try the #1 cups, too. Have fun with the project! How strange that yours didn’t melt down all the way- I’ve since tried some plastic cups from a party store and did not have much luck, so I think I may need to test a bunch of cups out soon! I haven’t tried painting them, but I’m thinking the paint might melt off…. anyway, they get hard after they cool- harder than the original cups, which have some give. I saw a recommendation on another site with a similar project to use the outside grill. Then you don’t have the issue of fumes inside. You know, I have heard of that, and it’s a great idea. I still wonder where people are finding the right cups anymore. Have you bought some? Regarding sourcing the cups, look for disposable plastic wine glasses. They are a heavier weight and tend to be #6s. My local Cash and Carry has them in four different sizes, hundreds of them (they’re not wine glass shaped, just sturdier disposable cups). I would think other places that specialize in event or restaurant/catering supplies would have them. I used a $10 heat gun from Harbor Freight to melt hundreds of these for a school project. It worked beautifully and some of the kids had such great ideas about different tooling and melting techniques. Big fun! I was thinking about the small cups. My thought was to use them on a wind chime. take a juice can for the center, use nuts on fishing line for inside to make the sound, then fishing line with the cups and beads for decoration. Each one would be personal to the makers taste. That sounds like such a cool extension of the project! It’s the kind of thing that would be so fun to see how everyone approached how they colored the cups and then how they assembled everything- oooooooh I like it.